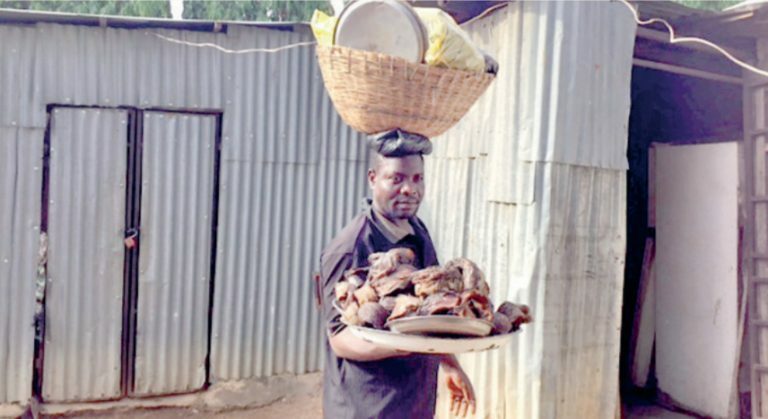 The worsening economic hardship in the country now threatens marital peace and affection in the home of a fish seller in Kaduna, the Kaduna State capital. The beleaguered man is now a symbolic representative of Nigerians engaged in a daily struggle to survive in the face of galloping inflation in the country. Every day, Mallam Ibrahim Jibrin, 35, rises as early as 5:00a.m to go for Muslim morning prayers, and by 6:00am, he hits the road, heading for Sheik Abubakar Gumi Central market in Kaduna metropolis to take delivery of dried fish he had booked for the previous day, for retailing. He used to book for as many as five cartons, but nowadays, he can only order for a carton, which currently costs N30,000.00 as against N15,000.00. Even at that, Jibrin still finds it difficult to sell off the lone carton within a week. The slow-moving sales Jibrin is experiencing is attributable to the noose of economic hardship tightening around the necks of Nigerians across the country. The situation has reduced purchasing power of many Nigerians. After taking delivery of the fish at the Central market, Jibrin moves round every nook and cranny of the city, hawking the fish, but focusing mainly on the southern axis of the town where he gets more patronage than the northern side. This is what he has been doing for the past 15 years in Kaduna city as his source of livelihood. Jibrin who is from Dogowa Local Government Area of Kano State, but resident in Kaduna, is married to two wives and has seven children. He caters for his family from the profits he makes from the fish retailing business. In the course of time, he developed a spectacular sales strategy that has greatly helped him. When he is approaching the likely buyers of the fish, he would start his advertisement jingle by shouting, â€œJollof rice, egusi soup, jollof rice, egusi soupâ€ to attract the prospective buyersâ€™ attention, indicating that his dried or smoked fish is the best condiment for cooking jollof rice or egusi soup. However, Jibrin said he is not happy with the present economic hardship in the country, which, according to him, has severely hurt his fish retailing business, resulting in very poor sales and sometimes no sales at all. His words: â€œPeople no longer buy fish like before, if it were before, I would sell all the fish without wasting time. I used to buy five cartons of the fish at N15,000.00 per carton from Borno State, but now it is N30,000.00 per carton. Where is the money and where are the customers who will buy? Everybody is complaining of no money. In order to cope with the biting economic situation, the fish seller said he is already considering relocating his family back to the village in Kano State to reduce the burden on him. Asked to give an insight to the precipitous drop in sales of fish, he blamed his woes on the state of the economy. Jibrin said that during the past administration, government officials and workers formed the bulk of his customers, unlike the present situation where he is not getting patronage from them. The roving fish seller pointed out that when the going was good, some customers, after buying the fish for themselves, would also buy for their friends as gift. Some even buy for passersby who ask for charity. But today, Jibrin revealed, the cost of living has become so high that it is now difficult for people to do such acts of charity. He disclosed that in order not to go home empty handed because of lack of sales for the day, he has added a kind of stylish begging for alms and also pleading with customers to buy the fish whether they are ready or not. To this end, Jibrin said he has concluded arrangements to relocate his family of two wives and seven children back to the village where they will enjoy free accommodation and communal assistance of the extended family, pending when the situation would improve. Also, Jibrin said he would in due course sublet two of the rooms in his three bedroom apartment in Rigasa area of Kaduna city, to enable him make ends meet. Bemoaning his fate, Jibrin disclosed he had eaten deep into his capital, to cater for the wellbeing of his family. He said that if the trend continued, he might run out of business. â€œIt is just that it is better to go out and sell the little fish that I have than to remain indoors, because there are no sales at all nowadays. Fish business has collapsed since President Buhari came to power,â€ Jibrin said. Asked whether he would vote for Buhari again in the hope that the situation would improve in his second term, Jibrin said: â€œI donâ€™t think I will vote for Buhari again because I thought he would remember the masses that brought him to power, but he left us behind and started helping those that did not vote for him during the 2015 election.